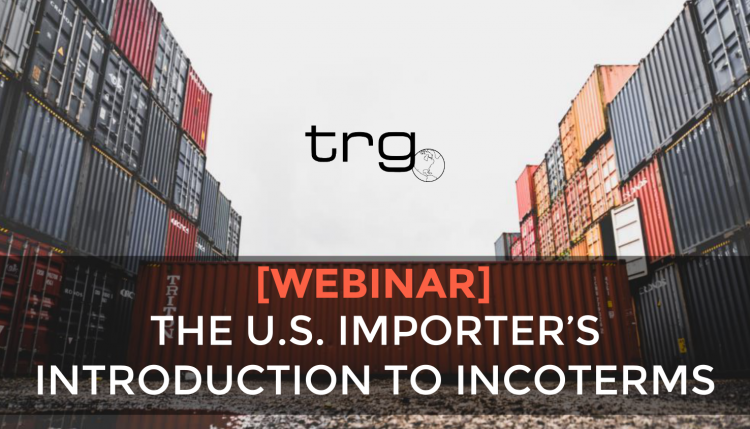 Trade Risk Guaranty hosts a webinar with a marine cargo insurance expert presenting an introduction to incoterms for United States importers. When it comes to shipping internationally, there is an endless list of potentially confusing elements involved in the transaction. However, at the top of that list are Incoterms. It can be difficult for an importer to determine which one is best for their business practices and how their marine cargo insurance policies fit into it all. 00:00 – Hello and welcome to this month’s webinar: U.S. Importers Introduction to Incoterms. I’m Nick Esposito and I’ll be your host today. I wear many hats here at TRG but one of my favorite roles is that of an educator to both my fellow co-workers and you, my audience of importers, exporters, and other international trade professionals. 00:27 – Joining me today is Felicia Donohoue, TRG’s Marine Insurance Manager. Felicia is an expert in the area of marine cargo insurance and she works tirelessly on behalf of our clients, helping them through the claims process and ensuring they’re adequately covered. 00:45 – This webinar is being presented by Trade Risk Guaranty Brokerage Services LLC, or as we’re commonly referred to as TRG. We’re located in the heart of downtown Bozeman, Montana. For those unfamiliar with Bozeman, Montana, it’s nestled right above Yellowstone National Park in southwestern Montana. If you’re in town, don’t be shy! Stop on by the second floor of the historic Rocking ‘R’ Bar building. Our direct-to-importer business model is unique to the Customs Bond and Cargo Insurance markets. We’ve grown our business over the last 25 years to encompass over 10,000 clients from all avenues of international trade. 01:22 – As an important disclaimer, the information presented in this webinar is for information purposes only and is not intended and does not constitute legal advice. We will be recording this webinar and it’ll be available on YouTube for future reference. If you have any questions during the presentation submit it via the questions section of the webinar interface. The questions will be reviewed and answered by myself or our team of marine experts at the end of or shortly after the webinar. 01:50 – If you have any additional questions outside of the webinar or if you’d like to be part of a community of trade professionals, join our Facebook group: International Trade Professionals – TRG. We regularly check the group for questions and encourage our members to start conversations amongst themselves if they have a common problem. And on over to Felicia. 00:00 -Thank You Nick! In today’s webinar, we are going to be covering the basics that every importer needs to know about Incoterms. 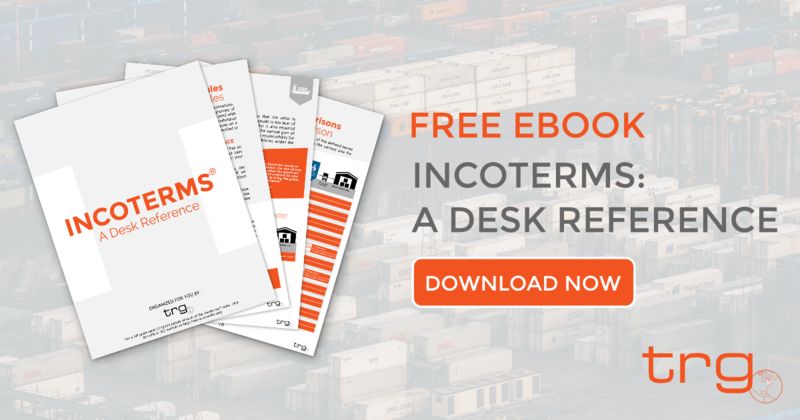 This includes an introduction to what they are, diving into the five most commonly used Incoterms, going over an example of how to locate and identify the Incoterms on a sales document, and finally some advice from our years of dealing with Incoterms. 02:35 – As a reminder, this webinar is being presented from the perspective of a U.S. importer. We will be briefly identifying the differences in the buyer and seller’s responsibility with individual Incoterms, but the information will be analyzed from the perspective of a buyer in the United States that is importing the goods. As an additional disclaimer, we will also be focusing on the insurance responsibilities within the Incoterms. So although Incoterms define other responsibilities within the transfer of goods from buyer to seller, we will be focusing on how your Incoterms relate to your marine insurance policy. 03:14 – Alright let’s dive right in and get started by answering the simple question: What are Incoterms? Incoterms are a series of pre-defined commercial terms published by the International Chamber of Commerce, also known as the ICC, that informs sales contracts by defining respective obligations, costs, and risks involved in the delivery of goods from seller to buyer. 03:42 – Incoterms are internationally recognized so they primarily intended to clearly communicate tasks, costs, and risks associated with the transportation and delivery of goods. So, as mentioned, Incoterms are governed by the International Chamber of Commerce and they are accepted by governments’ legal authorities and practitioners worldwide. The purpose of Incoterms is to have clearly defined sales terms that are not subject to interpretation country by country. Incoterms can be understood regardless of where the goods are being bought or sold from. 04:18 – Incoterms are amended every ten years. The current Incoterms are from 2010 but the ICC are already working on preparing the new versions which will be called Incoterms 2020 and will be released in 2020. These amendments are sometimes small changes in wording but also sometimes result in the elimination or combination of existing sales terms. For example, when the current iteration of Incoterms were released in 2010, two previously existing terms were eliminated. Currently, there are 11 existing terms defined by the ICC. 04:54 – So why is it important to know your Incoterms? Well knowing your Incoterms and understanding them reduces the likelihood of disputes, misunderstandings, or hedging on either side of a marine cargo insurance claim. In the event of a claim, a marine cargo insurance policy can only pay for goods that the policyholder has an ‘insurable interest’ in. So if the Incoterm listed on the sales contract says that the other party owns and is responsible for insuring the goods, your policy legally cannot pay that claim. 05:30 – Also if the terms of the agreement are not in writing, it is harder to substantiate a claim. The policyholder would basically be asking the insurance provider to take their word as truth at a time when they are financially motivated to maybe stretch the truth of it. This is known as a ‘moral hazard’ and it decreases the credibility of your claim which is heavily weighed during a claims review. 05:56 – Going back a step let’s define ‘insurable interest’. This means ‘to have a stake in the value of an entity or event for which an insurance policy is purchased’. To mitigate risk or loss, if you are not subject to a financial loss from an event you would not have insurable interest and would not be able to purchase an insurance policy to cover that event. When applied to Incoterms, Incoterms define the responsibilities of the buyer and seller, and define who ‘bears the risk’ and where that risk transfers. Whether or not you stand to suffer a financial loss depends on who owns the goods and bears the risk. Therefore, the incoterm named on the sales documents defines who has insurable interest at what point of the transportation of goods and can, therefore, greatly affect whether an insurance policy can pay out on a claim. 06:48 – So now that we understand what Incoterms are and why they are important, let’s go over a few of the most commonly seen Incoterms. Even though there are 11 total Incoterms in the 2010 iteration, these are five of the most commonly seen and used by TRG customers. The top two being CIF and FOB, which we will be comparing later in the presentation. 06:48 – So let’s start with CIF. CIF stands for ‘Cost, Insurance, Freight’. And the official definition is as follows: ‘The seller delivers the goods on board the vessel or procures the goods already so delivered, the risk of loss of or damage to the goods passes when the goods are on board the vessel. The seller must contract for it and pay the costs and freight necessary to bring the goods to the named port of destination.’ Also of note for this term is that it is only applicable for ocean shipments. 07:50 – So if we look at this more closely, we can see that the seller is responsible for providing for the cost and freight of bringing the goods to the port of destination specified by the buyer. Under these terms, the seller is also required to obtain insurance for the goods while they are in transit to the named port of destination. 08:11 – Once the goods arrive at the port of destination, the responsibility for the goods transfers over to the buyer and the seller’s responsibilities under the contract are concluded. Now although CIF may seem like the easiest option for importers and often seems like the cheapest since the price quoted or invoiced by the seller includes insurance and all charges up to the name for a destination, it is important to understand the transfer of risk and how this affects each side of the transaction. 08:39 – If the seller only provides insurance up to the destination port, it’s important to ensure you’ve discussed an inland marine insurance policy or endorsement with your insurance providers. Here we can see the different aspects each party is responsible for that may have an impact on marine cargo insurance. For example, the seller is responsible for providing insurance on the buyers behalf but only up to the port of destination. 09:01 – Any losses that occur during final delivery need coverage under a separate policy. This term also places packaging and wrapping with the seller. Since the buyer bears the risk for the majority of the transit, it may benefit your company to insure goods are packaged in a manner that makes a safe delivery most likely. 09:27 – Next up is FOB, which stands for ‘Freight on Board’ and the definition here states ‘The seller delivers the goods on board the vessel nominated by the buyer at the named port of shipment or procures the goods already so delivered. The risk of loss or damage to the goods passes when the goods are on board the vessel and the buyer bears all costs from that moment onwards.’ This is also an Incoterm that should only be used for ocean shipments. 09:59 – So under this term the seller must load the goods on to the ocean vessel chosen by the buyer. The seller is responsible for the cost and risk associated with the goods up until the point when they pass the rail of the ship at the origin port. Under FOB Incoterms, the risk and responsibility transfer at the same time, when goods passed the ship’s rails. 10:25 – Now remember that the definition states goods are delivered at the named port, so the identifier should include, that named port, in documentation. 10:36 – Now onto ExWorks. Here the definition states that ‘The seller delivers when it places the goods at the disposal of the buyer at the sellers premises or at another named place. The seller does not need to load the goods on any collecting vehicle nor does it need to clear the goods for export where such clearance is applicable.’ This incoterm can be used for any mode of transit. 11:03 – Therefore, the seller must prepare the goods for collection at his premises to be collected by the buyer. This Incoterm puts the greatest amount of risk on the buyer with very minimal obligation on the part of the seller. Although the responsibility of packaging and wrapping the goods lies with the seller, the responsibility of loading the goods at the source location falls on the buyer. However, this process typically has to be supervised and coordinated by the seller for logistical reasons which can lead to an ambiguous transfer of responsibility if an incident occurs during the loading process. 11:38 – To avoid this ambiguity, it is important to clearly define which party is responsible in the event an incident occurs. As you can see, the majority of responsibilities lie with buyer under this incoterm but it also affords the buyer the most control because risk transfers at the sellers location. This term of sale would allow for the most continuous coverage under an annual marine cargo policy. 12:39 – Happily, this term can also be applied to any mode of transit. So the seller must make the goods available to the buyer at a pre-arranged named location, typically, the buyer’s warehouse, factory or office. The seller is to cover all expenses associated with getting the goods to the agreed-upon location, this includes any expenses incurred when unloading the goods from the carrier and any procedure or tariff costs that may apply from Customs. 13:08 – When using this Incoterm, the seller bears the full responsibility of cost and risk until the goods have been unloaded at the agreed-upon location, however, it does give the buyer full control over the mode and cost of the transportation used to deliver the goods. This incoterm gives the seller more control than some of the other Incoterms we’ve looked at, but still places the risk on the seller. As you can see the inland transportation responsibility depends on the agreed place of delivery. 13:37 – If your DDP shipments are not being delivered to final destination, it’s important to ensure you have domestic inland coverage. 14:11 – The seller is responsible for delivering the goods to the port specified by the buyer and is responsible for the cost of transporting the goods to the destination port, however, the cost of insuring those goods throughout the journey is the responsibility of the buyer. When this Incoterm is used, the risk is not transferred to the buyer at the same time as the cost. The risk is transferred from the seller to the buyer at the time the goods are loaded onboard the ship at the port of origin despite the fact that the seller is responsible for arranging transportation of the goods to the destination port. 14:43 – This is also an Incoterm that should only be used for ocean shipments. Comparing responsibilities, CFR and CIF look pretty similar, the main difference being insurance. While that is definitely a big difference it’s also important to note that the risk is owned by the seller for most of the journey. 15:10 – Now that we have gone through the five most common Incoterms, let’s look at how Incoterms appear in real life situations and how they affect the cost of goods. A typical situation for some importers is to order goods from Alibaba. If you are unfamiliar with Alibaba it’s a Chinese multinational e-commerce retail internet AI and technology conglomerate that provides consumer-to-consumer, business-to-consumer, and business-to-business sales services via web portals. Many United States importers use this portal to find suppliers and manufacturers. 15:46 – When you are shopping in Alibaba, the screenshot shown here is what you will see as you search through suppliers. We’ve blocked out any personal details of this particular supplier because we really want you to pay attention to one specific part of the interface. 16:00 – Highlighted in red, you can see where they specify that the price shown for this item is the FOB price. The default Incoterm on Alibaba is FOB, but as we’ve seen different Incoterms include different expenses. So if you want to compare you will need to request prices on different Incoterms. So we went ahead and requested prices for different items under FOB and CIF Incoterms and we were able to get a couple of responses and here is how one of those looked. 16:31 – As you can see the different prices were sent via a direct message and there is quite a difference between the unit prices under these two different terms of sale. For FOB, the unit price for 1000 units is $3.99 per unit and, for CIF, the unit price for 1000 units is $4.15. When we look at these two prices we can see how much the end cost would be for both but it is important to remember what is included in each of these prices. 17:02 – Here is a very brief look at some of what is included and not included in these two prices. Now at first glance CIF may look like the superior choice, and for some importers it may well be, but let’s look into more detail in a second example of comparing CIF and FOB. 17:21 – This example was first outlined for our webinar specifically covering the Incoterm CIF. For more insight into that Incoterm, check out our YouTube channel where you can watch all of our past webinars. So in this example we are going to be looking at the commodity of LED flashlights with the classification 8513.10.2000 this carries a duty rate of 12.5%. We’re going to be looking at full container loads to keep this simple and a full container load of these flashlights would include 432,000 flashlights we’re also going to be using the port Ningbo, China to Seattle, Washington. 18:04 – So let’s take a look at these two different importers; first Importer A. Importer A buys their goods using the Incoterm FOB, they pay $1.12 per flashlight, and they have three FCL shipments a year. They buy their insurance on a shipment-by-shipment basis using the Institute Cargo Clause A. They contract all of their own freight, as you would have to do with FOB. 18:31 – Importer B buys their goods CIF, they pay a little bit more just under one percent more at $1.13 per flashlight. They have three FCL shipments for the year as well and then their insurance is contracted by the shipper and the shipper contracts the freight as well. 18:43 – You’ll see that their insurance is Institute Cargo Clause C because that is what you would typically get when buying your goods on CIF terms. To learn more about the difference between these two insurance types, check out our webinar on marine cargo insurance. 18:59 – Looking at the math for importer A, we’re going to see that for a full container load, they’re going to pay $483,840.00 for the goods themselves, that’s a full container of these flashlights. They’re going to pay duty on those flashlights of $60,480.00. That’s twelve point five percent of the total number. The freight charges they’re going to pay are just under twenty three hundred dollars, their in insurance, per shipment at thirty cents per hundred, is about fifteen hundred dollars. So that means the total cost for their shipment is five hundred forty eight thousand dollars seventy five dollars and sixteen cents. 19:38 – Importer B however is buying their goods on CIF terms, their flashlights are a little bit more expensive but that includes all of their freight and insurance. So they’re going to pay $488,160.00 for the flashlights. Now because their manufacturer didn’t separate out the freight on their commercial invoice, they’re paying twelve point five percent on the total amount invoiced. So the duties are a little bit more at about sixty one thousand twenty dollars that brings their total cost per shipment up to five hundred forty nine thousand one hundred eighty dollars. 20:20 – Comparing the two we see that the total cost with three shipments in a year for importer A is one million six hundred forty four thousand two hundred twenty-five dollars and forty eight cents. Importer B buying CIF pays more than that, they pay one million six hundred forty seven thousand five hundred forty dollars a year. That’s a difference in cost alone of three thousand three hundred fourteen dollars and fifty two cents. 20:44 – So over the course of the year Importer B is paying thirty three hundred dollars more and they’re receiving less insurance coverage. This cost difference increases even more dramatically if Importer A purchased an annual marine cargo insurance policy instead of paying their insurance on a shipment-by-shipment basis. 21:01 – So through these two examples you can see how identifying those Incoterms can affect your importing cost even if you never have a claim. And again, if a claim arises the selected Incoterm will have a huge effect and whether or not the claim is covered by your marine cargo insurance policy. 21:19 – So now let’s move into some advice we want to leave you with. These are a few tips we feel are important for importers to know when it comes to their Incoterms. One, always have Incoterms written, before it ships, on one of your sales documents. Correcting documentation retroactively, like when you need to file a claim, is hard to do especially if the correction does not benefit the party that has to make the correction. Making changes after the fact can also have a feeling of impropriety because of that moral hazard issue we talked about. It can also even be a red flag for fraud. 21:56 – Two, don’t let software auto fill in your Incoterm. Make sure you know what you are using and why. Anything on an invoice or international trade document that you don’t understand should be clarified. As we said Incoterms are internationally recognized and enforced. Unfortunately, the argument that the software completed the document incorrectly won’t hold water during a claim because a reasonable business person is expected to review and confirm contracts or bills of sale. 22:27 – Three, you do not need to use the same Incoterms with every contact or supplier. You can absolutely negotiate different Incoterms with different vendors based on your needs. Just make sure you know and uphold your responsibilities with every party you contract with. You should also check with your insurer that you have the proper scope and coverage type for each incoterm you use. 22:50 – Four, be able to substantiate your claim no matter the perceived trust that has been in the relationship. Whether you’ve worked with your supplier one year or twenty years, you should remain vigilant in maintaining your documentation. The simple fact of the matter is that it’s business and both parties need to be held responsible to their end of the agreement. 23:10 – And that’s it in today’s webinar! We drove right into what Incoterms are, discussed the five most commonly used Incoterms, learned the importance of identifying your Incoterms and how that can affect your cost, and finally we left with you with a few tips to keep in mind gathered from our experience in the industry. Now we have a few pre-submitted questions we would like to go through and answer. However, please submit your questions and we will try to answer them with the time we have left. 23:36 -But before we get to all of that, I am going to pass the mic back over to Nick to tell us a little bit more about TRG while you submit your questions. Excellent, thanks Felicia! While you prepare those questions I’m going to quickly go over Trade Risk Guaranty’s unique position in the market. 23:53 – Again we sell directly to consumers, so rather than purchase through a third party we let you buy direct which gives you an option for lower pricing and very competitive customer service and claims assistance. All of our policies are written through the Lloyd’s of London or XL Catlin markets. Lloyd’s of London is the largest insurance market in the world, they created cargo insurance. XL Catlin is a domestic provider that enables us to underwrite amazing policies at a low price. 24:19 – As I mentioned before, if you have a loss you’re going to speak directly with Felicia and her team, but that doesn’t mean we can’t handle a loss anywhere. We have representatives around the world ready to help in the case of a loss to make sure you get paid the right amount quickly. Finally, our policies are custom. We offer all three international, domestic, and warehouse coverage and they’re all wrapped around your business. These are not blanket policies and these are not off-the-shelf policies. These are policies written directly for you and your needs based on your business. Making sure you have the coverage you need. 24:55 – Typically in the insurance market, are premiums starting at 2,500 to 5,000. However, our annual all-risk policies start at some of the lowest annual cost in the market. We start at $750 a year. We did this to help out importers of all sizes, not just those that shipped millions of dollars. Here we want to make sure that the importer that does three hundred to a hundred thousand can buy a policy that covers them. 25:51 – Next question was ‘Can all of the Incoterms legally be used for either ocean or air shipments or are some Incoterms only for ocean shipments or air shipments exclusively?’ So as we briefly mentioned in our presentation, certain Incoterms are open to use for any mode of transport and some are restricted to only water vessels. I suggest reviewing an Incoterm selection guide for guidance of which ones are which. And TRG will be releasing our own selection guide shortly so keep an eye on your inbox for that. 25:27 -Next question, ‘I have been told by others that it is best to use FCA Shippers Door rather than ExWorks. Is this true? And if yes, why? So there are so many Incoterms and so many different variables for different companies so there’s really no one incoterm that’s a universal best fit. That’s why there’s 11. The main difference between FCA and ExWorks is that some services and costs that are predetermined under ExWorks require explicit specification under FCA. Such as arranging and loading precarriage. 27:00 – And then another question related to ExWorks, ‘What is the benefit of ExWorks?’ I have heard it said that a supply chain is only as strong as its weakest link. In my personal opinion ExWorks affords the buyer control over virtually every aspect of their imports reducing the risk of another party weakening their supply chain. The buyer is responsible for almost everything and if the buyer has good supply chain controls in place, the buyer can save time and money and avoid potential errors. 27:35 – Next question, ‘How much weight do Incoterms usually have in regards to legality?’ As I mentioned, Incoterms are written by the ICC and while that is not a governing body, Incoterms are internationally recognized and enforced by both courts and insurers. The purpose of Incoterms is to ensure that sales contracts are unambiguous and that responsibilities under each term can be understood regardless of language or cultural barriers. 28:08 – Next question, ‘My invoice doesn’t have Incoterms on it, but it does have payment terms. Is that a good indicator of my Incoterms?’ So for this one the simple answer is no. While there are industry standards for certain payment terms accompanying certain Incoterms, they are not mutually exclusive and can be intermixed when you pay for an item does not necessarily indicate transfer of risk. You need to make sure that you have actual Incoterms noted somewhere whether that be an invoice, packing list, or purchase order. 28:42 – And it looks like that’s all the questions that we have time for. Thank you for joining us! Thanks Felicia. I know we got some other questions out there, we’ll follow up with you guys after the webinar and if you have any other questions please don’t hesitate to reach out to me directly. My email is Nick.Esposito@traderiskguaranty.com. 29:03 – You can also check us out on Facebook. Our Facebook group is a good place to go, International Trade Professionals – TRG. The added advantage of reaching out to the Facebook group is you’ll access not only us and our staff, but also experts in the international trade community. Additionally, check out our blog. It’s packed full of goodies; excellent articles, information, and again you can find us on Facebook, Twitter, Linkedin, Instagram. Send us some more questions you have and hope you guys have a great day. Thank you! 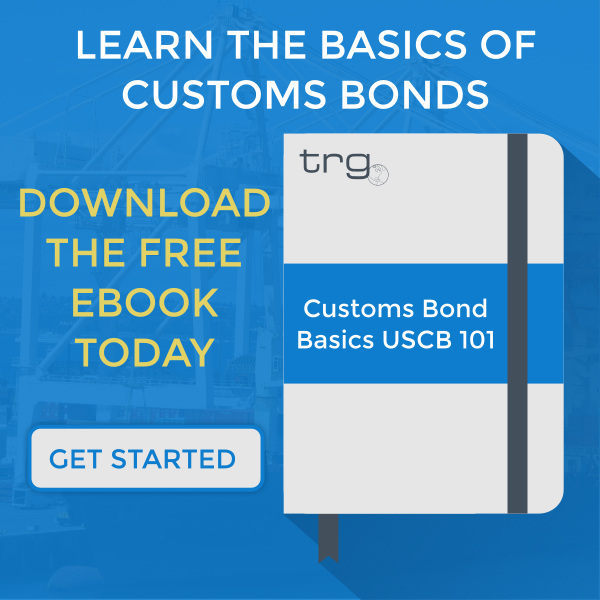 [Video] What is the Difference Between Single Entry and Continuous Customs Bonds?